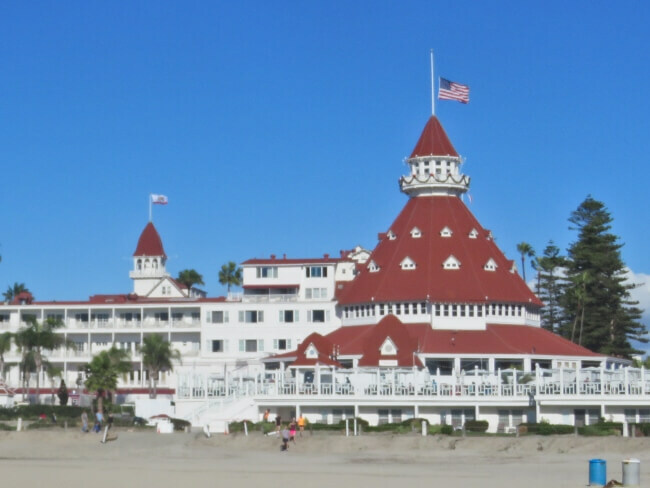 I recently had the pleasure to visit San Diego for a conference at Hotel del Coronado. Morning only meetings allowed me to explore during the afternoons and evenings of my 3 day visit. San Diego offers so much to explore. With limited time, I had to prioritize. The plan turned out wonderful, if not completely as expected. 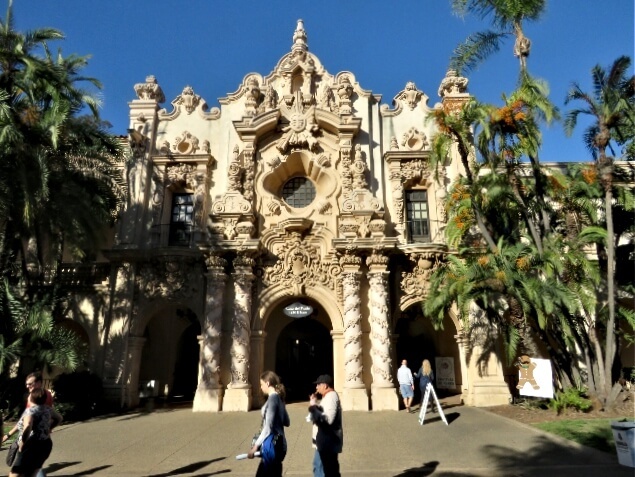 You could easily replicate it and get a wonderful tour of some popular San Diego sites. 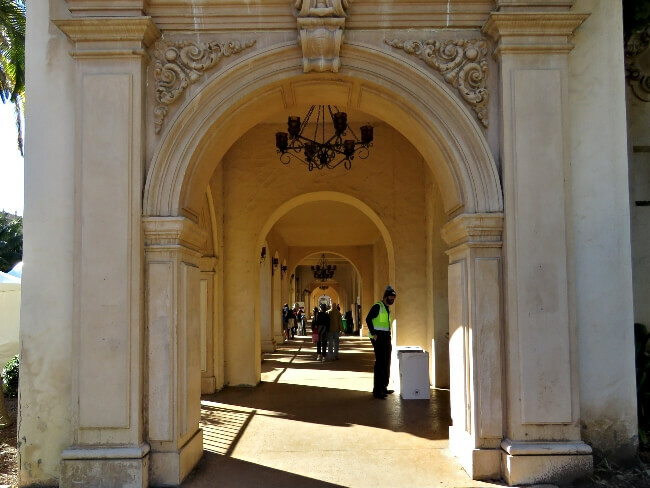 I had looked forward to seeing Balboa Park. 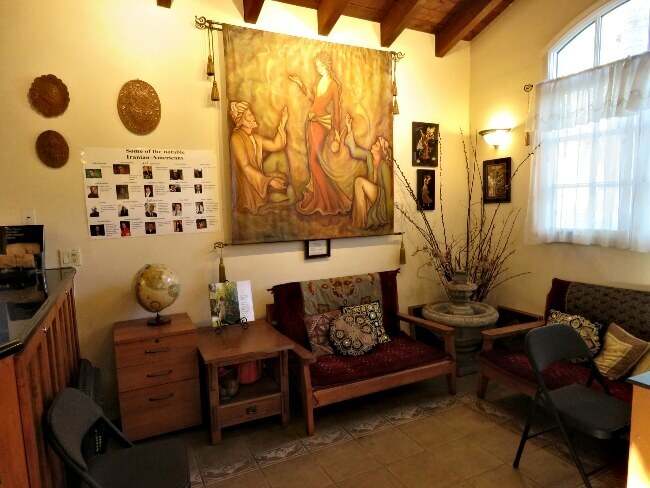 The acres teem with art, architecture, and gardens. I couldn’t wait to slowly roam, admiring it all. Things do not always work out as planned, though. As my Uber ride approached the park, traffic was horrendous and roads were closed. 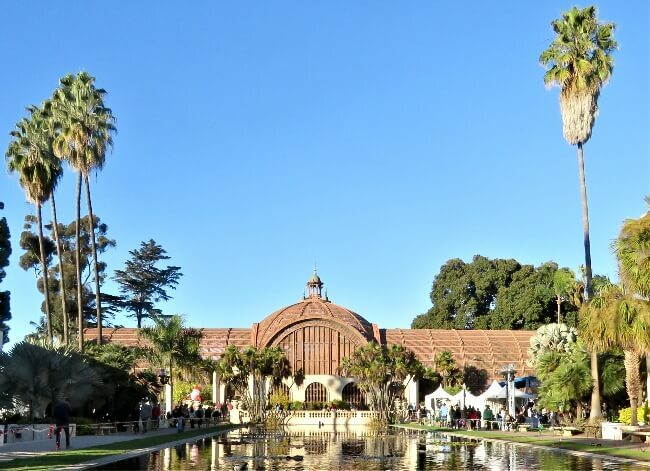 The Park was hosting its yearly Christmas festival: Balboa Park December Nights. Over 350,000 people crammed the park over a 2 day period. All through the park, food trucks, vendors, entertainers, and patrons packed the streets. 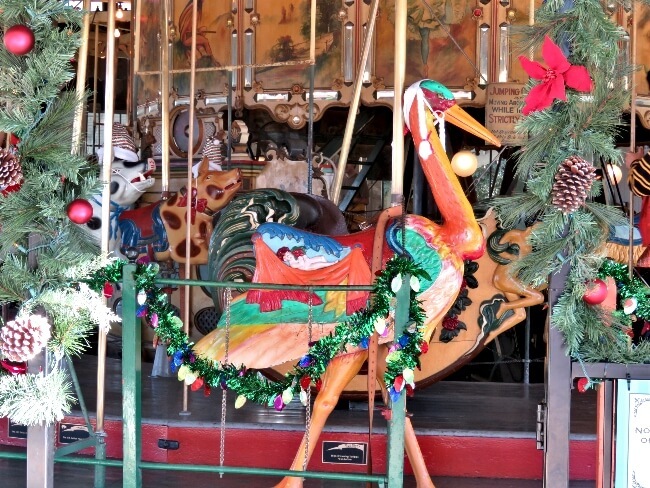 My driver dropped my off by the carousel. 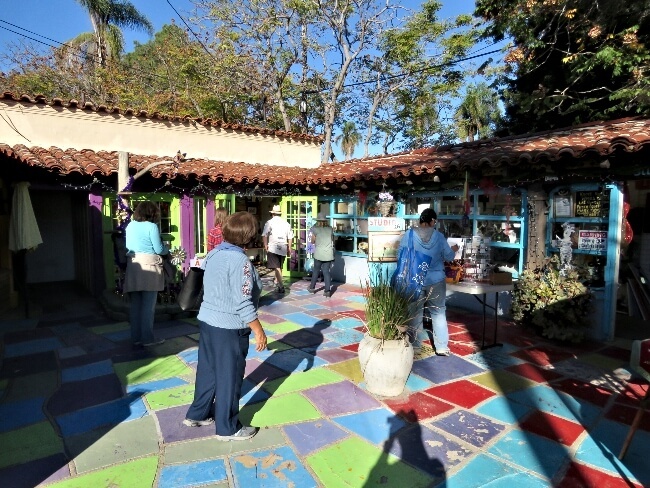 I headed straight to the Spanish Village Art Center. Artists studios lined the narrow paths. 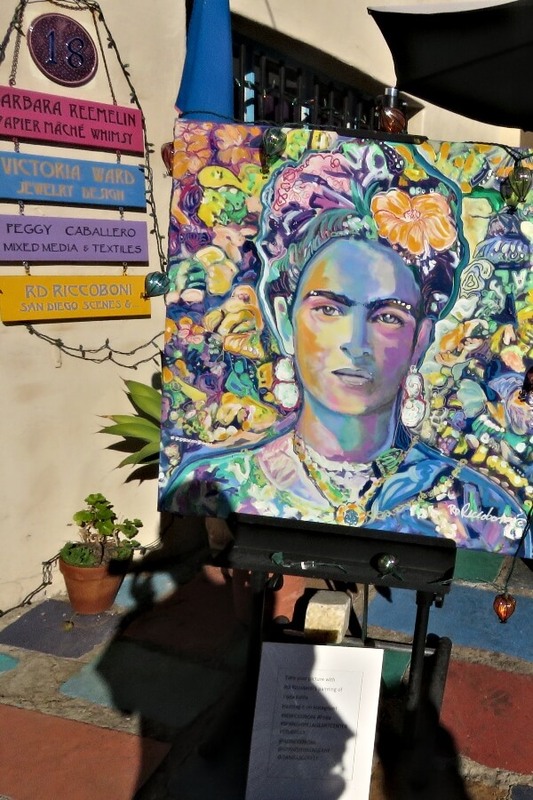 Interesting and beautiful original arts and crafts flowed onto the bright streets. I love browsing art! The Spanish Village was a treat. After leaving the art center, I headed to the Tea Pavilion at the Japanese Friendship Garden for a late lunch, then proceeded to explore the garden. The Japanese Gardens were beautiful. 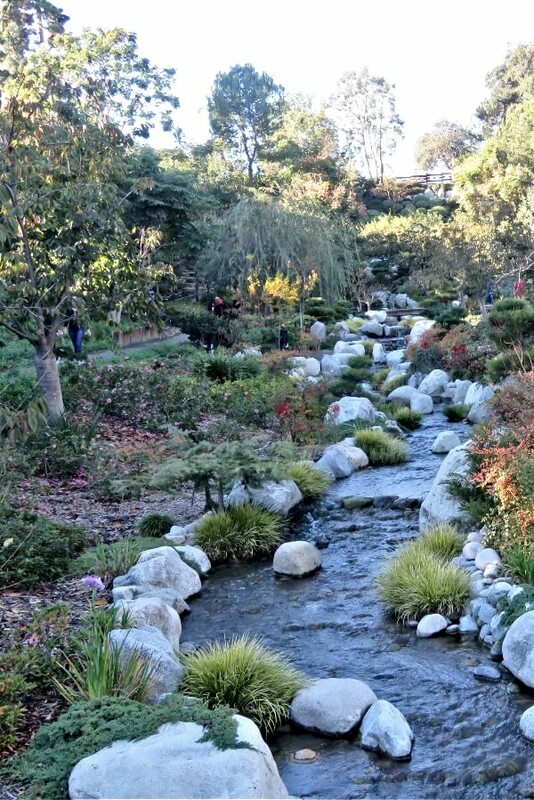 A steep, winding path, led past streams, waterfalls, flowers, bonsai trees, and sculptures. The food and the garden were both perfect. I walked across the Spreckels Organ Pavilion to the Palm Canyon. A choir sang Christmas carols. Palm Canyon provided another wonderful walk. 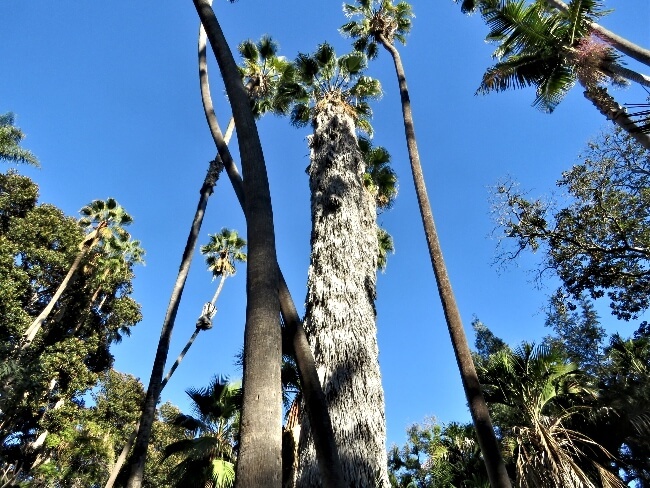 I descended into the well shaded valley and admired the huge palm trees and bamboo. Above Palm Canyon are the International Cottages. Small cottages left over from a 1935 exposition house exhibits from a variety of countries. 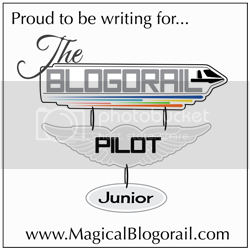 I had envisioned an mini-Epcot. With the Christmas Festival going on, all but one of the cottages, Iran, was closed except for food. It was much more like the Epcot Food & Wine Festival. I wandered off, a little disappointed. Finally, I headed to the main drag, El Prado. Spanish style architecture lines the street. The buildings are filled with museums and restaurants. Unfortunately for me, the museums were closed. Vendors obscured many views. Even so, the views were spectacular. It reminded me of walking through Malaga or Barcelona. My last stops along El Prado were the Lily Pond and the Alcazar Garden. The Lily pond lies in front of the unique Botanical Garden building, making an amazing vista. Again, the Botanical Garden was closed. The creators of the park designed the Alcazar Garden after the gardens in the Alcazar Castle in Seville, Spain. The Garden is stunning. An array of flowers, fountains, and turquoise tiles delight the eye. 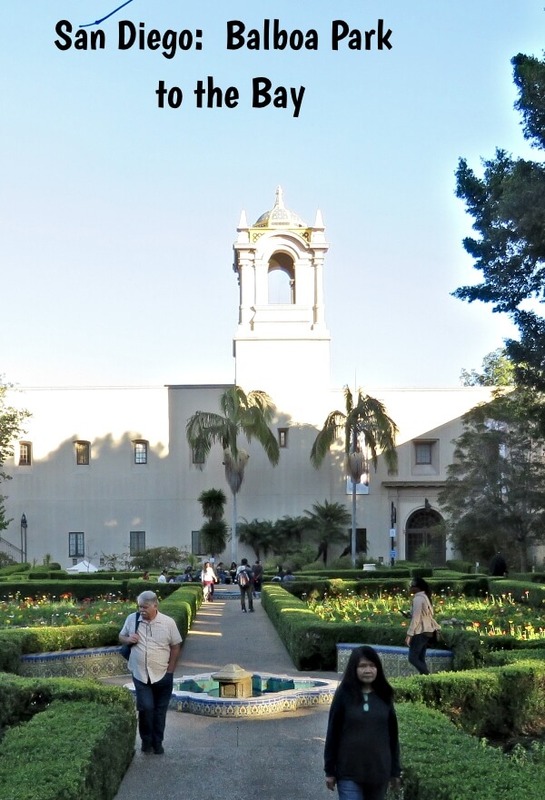 The Museum of Man with the California Tower and turquoise dome overlook the garden. None of the gardens disappointed. Some of the dogs enjoying a day at the park. I love Rasta Poodle. One benefit of having crowds was people watching. A diverse mix of people call San Diego home. The locals must really love their dogs. I saw more owners out walking their dogs here than anyplace I have ever been, by far. I crossed the Cabrillo Bridge, exiting the park and turned south on 6th Avenue. 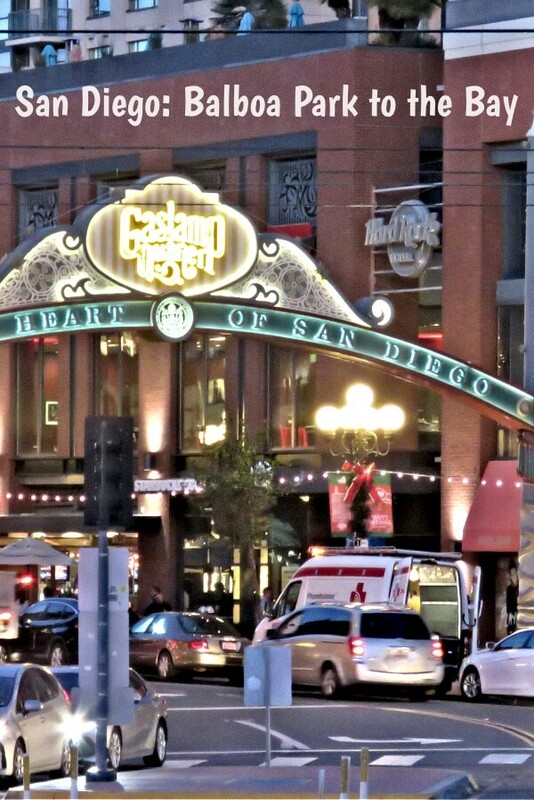 My next destination, the Gaslamp Quarter lies about a mile directly south. 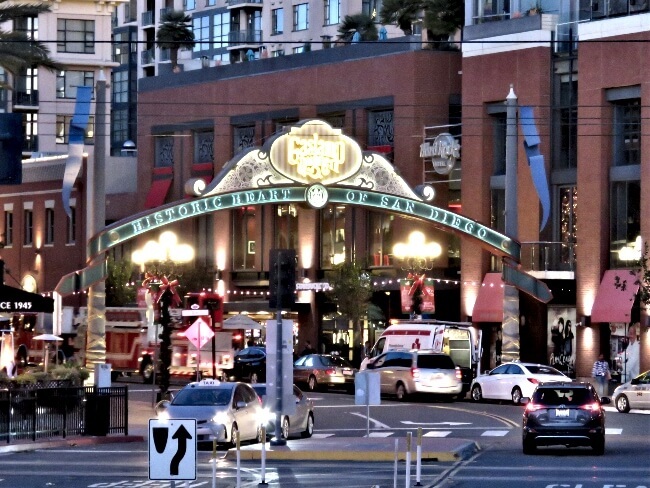 Restaurants, bars, galleries, and shops make the Gaslamp Quarter a popular destination for young adults. I looked forward to browsing, but wanted to make two stops: a Vietnamese restaurant and a gallery. Pho Express was an inexpensive Vietnamese restaurant that had good reviews located along my route. 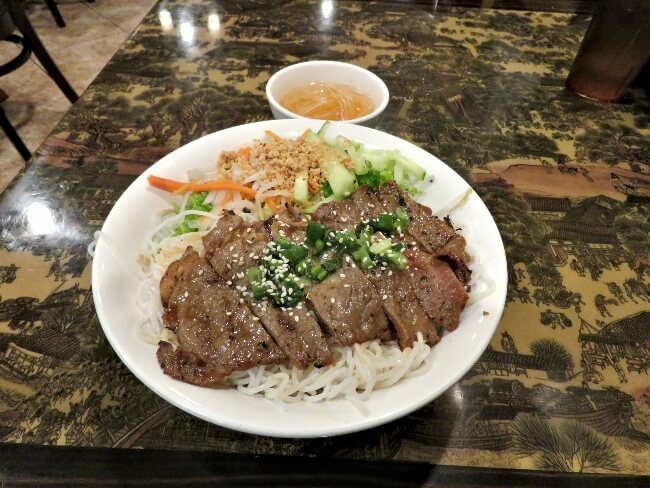 The Bun Bo Xao, lemongrass beef with rice noodles, hit the spot. It is one of my all time favorite dishes. Pho Express was an excellent choice. The stroll through the Gaslamp Quarter was enjoyable. While the wide array of shops, galleries and restaurants were interesting, I most enjoyed people watching. 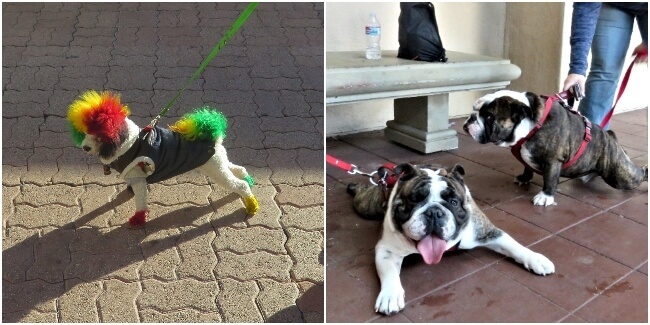 A wide variety strolled the side walks and cruised the streets. Lime scooters buzzed around everywhere! 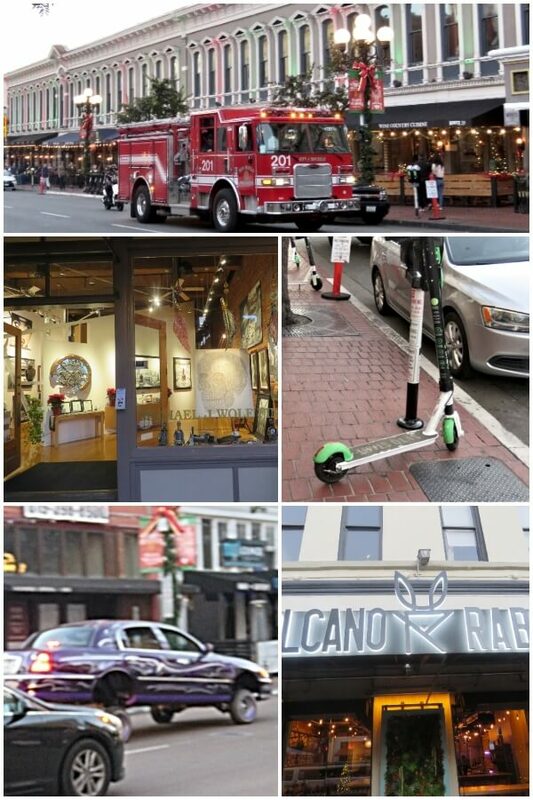 We have them here, but the Gaslamp District of San Diego has fully embraced them. 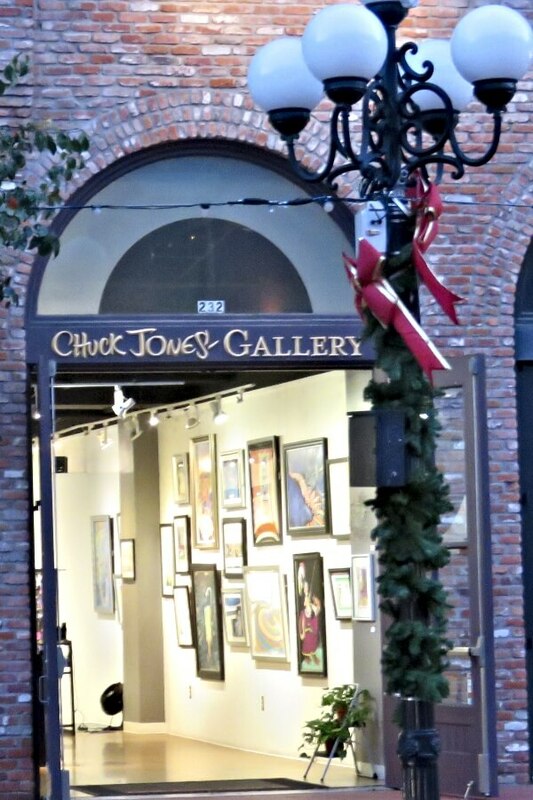 Near the south end, I found the Chuck Jones Gallery. Our family are huge Looney Tunes fans and believe that animator Chuck Jones and voice actor Mel Blanc were geniuses. Chuck Jones animated Looney Tunes, Peanuts, and Dr. Seuss shorts and movies. With the new Grinch movie having been just released, most of the gallery exhibits were from Dr. Seuss. I enjoyed browsing the art work, but would have liked more Bugs Bunny, Wile E. Coyote, Pepe Le Pew, etal. I wanted to find a gift for my son. The art for sale was quite expensive and no other merchandise was available, though. The San Diego Convention Center forms the the southern boundary of the Gaslamp Quarter. 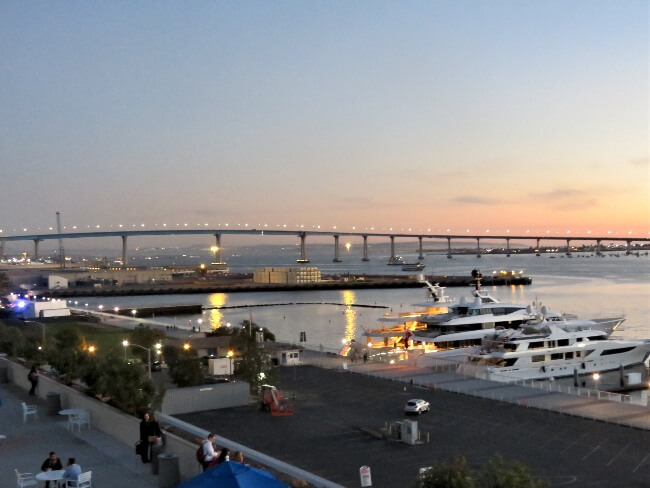 To get to the ferry back to Coronado, you have to climb over the convention center. The convention center interested me because its home of the original Comic Con. I now appreciate the architecture and the views of the Bay from the Grand Stairway. It was well after dark when I arrived at the ferry station. The ferry ride from San Diego to Coronado only takes about 5 minutes. It costs $5, but is worth it. 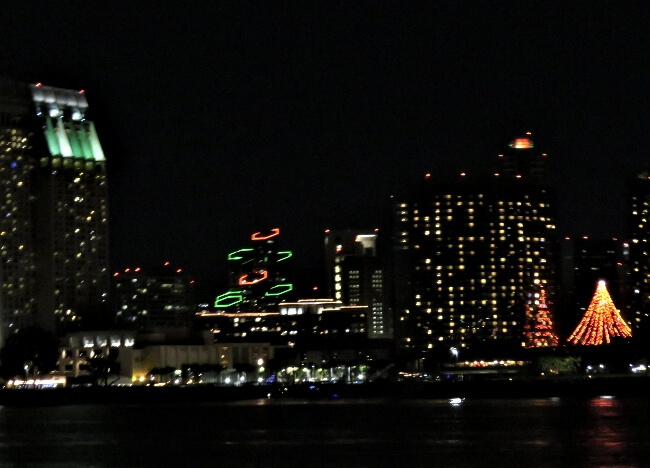 The San Diego skyline shines in the night. The City Christmas tree, adorned in red lights, provided a nice focal point. 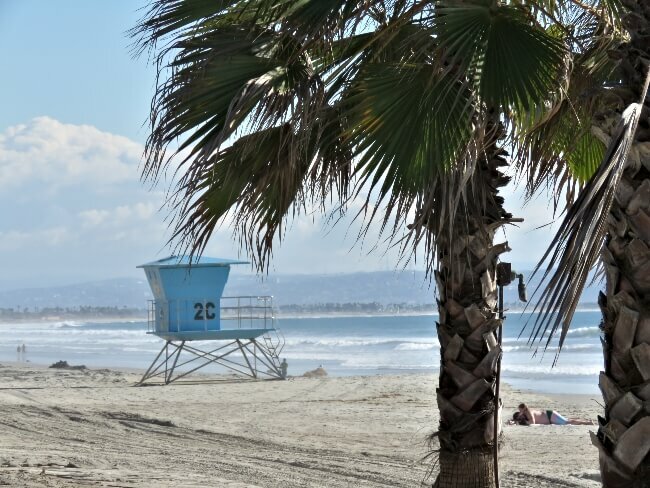 From Thanksgiving through New Years Day, the town of Coronado provides complementary bus service from the shops near the ferry depot, along Orange Avenue, to the Hotel del Coronado. I took advantage of this and shortly was back for the evening. A nice end to a wonderful day. 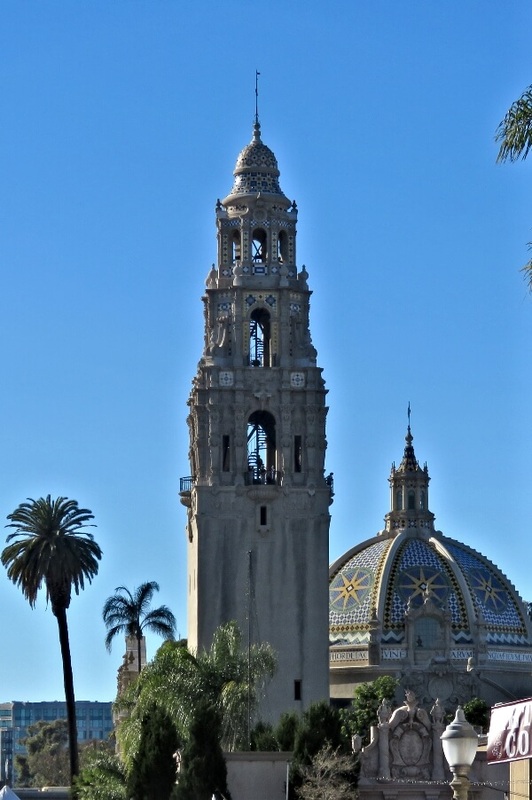 San Diego from Balboa Park to the Bay exceeded my expectations. 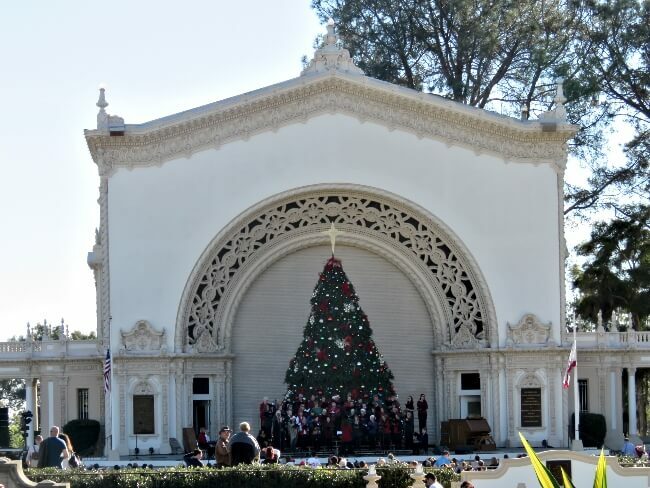 Despite crowds for the San Diego December Nights festival, Balboa Park impressed me and was a treat. There is plenty left to explore when I return. The Gaslamp Quarter and ferry ride completed a wonderful day. I thoroughly enjoyed the views, the people watching, and the spectacular weather (72 and sunny). The only downside was the prominence of homeless people. Between Balboa Park and the Gaslamp Quarter, approximately a mile, probably a hundred homeless people lined the green space along 6th Avenue. The vast majority were men appearing to be 30 – 60 years old. I did not feel threatened or unsafe, but I would not want my wife or son to walk it alone. The sad interlude brings to mind how fortunate many of us are. “There but for the grace of God go I.” Please excuse my assumption, but it also brings to mind the need for care and treatment of mental illness and substance abuse. 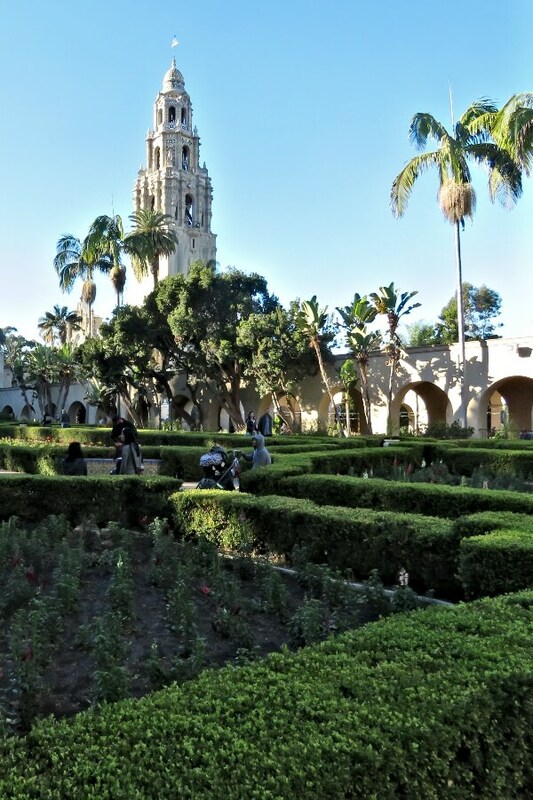 The next time I visit San Diego, I will return for a more in depth tour of Balboa Park. I also hope to visit the San Diego Zoo Safari Park, the U.S.S. Midway, and the beaches of La Jolla. San Diego is an amazing city and I can’t wait to return.